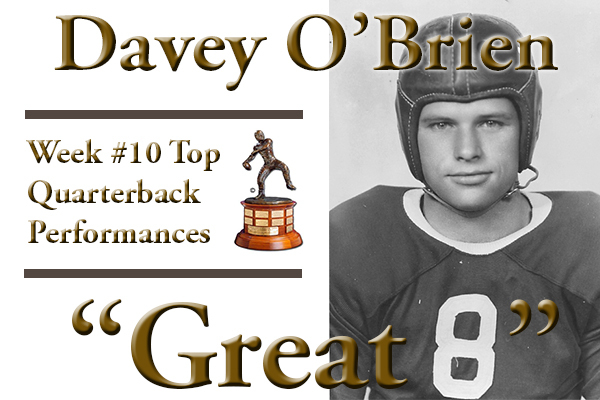 FORT WORTH, Texas (Nov. 9, 2015) – The Davey O’Brien Award has revealed the “Great 8” quarterback performances for week 10 as determined by voting from the award’s selection subcommittee. 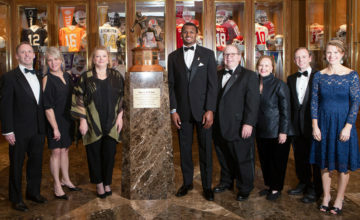 The eight honorees include: Brandon Allen of Arkansas, Washington State’s Luke Falk, DeShone Kizer of Notre Dame, Michigan’s Jake Rudock, Mason Rudolph of Oklahoma State, Baylor’s Jarrett Stidham, Deshaun Watson of Clemson and North Carolina’s Marquise Williams. Two of this week’s “Great 8” performers, Falk and Watson, are semifinalists for the Davey O’Brien National Quarterback Award. All 128 FBS quarterbacks are eligible for the weekly honor. The winner of the Davey O’Brien Quarterback of the Week Award, which will be one of the week’s “Great 8” quarterbacks, will be announced Tuesday at 5:30 p.m. (CT). O’Brien was drafted fourth overall in the 1939 NFL Draft and earned Pro Bowl honors in his rookie season after setting an National Football League record for season passing yardage. The NFL’s highest-paid player retired after the 1940 season to become an FBI agent. 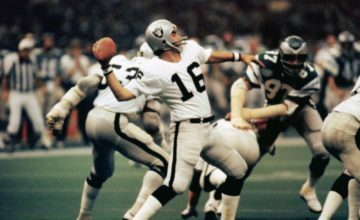 The Davey O’Brien Foundation was created in 1977, and the National Quarterback Award, the oldest and most prestigious college quarterback award, was first issued in 1981. 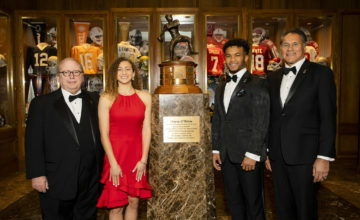 Since 1977, the Foundation has given away more than $900,000 in scholarships and university grants to help high school and college athletes transform leadership on the field into leadership in life. Brandon Allen, Arkansas, Sr., 6-2, 210, Fayetteville, Ark. * Led Arkansas to a 53-52 overtime upset victory over No. 18 Ole Miss by throwing for 442 yards and six touchdowns (33 of 45). * Threw for nearly 500 yards (497) and five touchdowns on 36 of 55 passing in a 38-24 win over Arizona State. * Accounted for six touchdowns (five passing) and connected on 19 of 26 attempts for 262 yards in a 42-30 victory over Pittsburgh. Jake Rudock, Michigan, Sr., 6-3, 208, Weston, Fla.
* Was 18-for-25 passing for 337 yards and a pair of touchdowns, and also posted a rushing score, in a 49-16 win over Rutgers. Mason Rudolph, Oklahoma State, So., 6-4, 220, Rock Hill, S.C.
* Tossed five touchdown passes, was 16 of 24 overall for 352 yards and had a 258.6 passer rating in a 49-29 win over No. 8 TCU. * Was 23 of 33 for 419 yards and three touchdowns and added a rushing touchdown in his debut start, a 31-24 victory over Kansas State. Deshaun Watson, Clemson, So., 6-2, 210, Gainesville, Ga.
* Accumulated 404 total yards (297 passing and a career-best 107 rushing) and had one passing touchdown in a 23-13 win over Florida State. Marquise Williams, North Carolina, Sr., 6-2, 225, Charlotte, N.C.
* Completed 23 of 35 passes for 494 yards and four touchdowns and added 30 rushing yards and a score in a 66-31 win over Duke.